GREEN BAY –It’s a big day in the NFC North, as both the Packers and the Lions take on other NFC division leaders. As the Packers host the NFC East-leading Eagles late Sunday afternoon at Lambeau Field, the Lions will be playing at the NFC West-leading Cardinals, though the Cardinals are without starting QB Carson Palmer, who was lost for the season last week to a knee injury. Detroit comes into the day one game ahead of the Packers in the NFC North standings. The Lions are 7-2 while the Packers are 6-3. The Eagles are 7-2 while the Cardinals are 8-1, meaning four teams that have combined for just 10 losses so far this season will have two more losses hung on their records today. 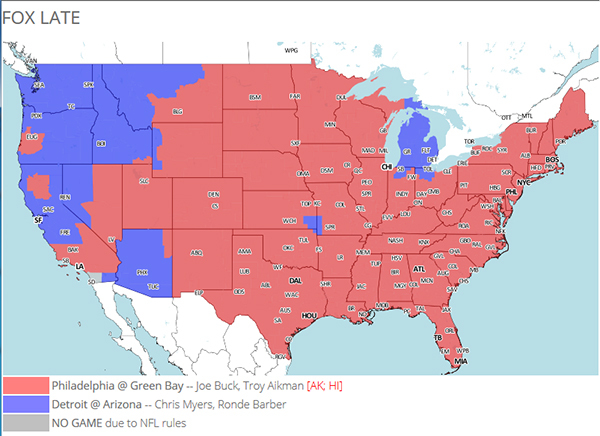 Elsewhere in the NFC North, the 3-6 Bears are hosting the 4-5 Vikings. The Bears led 14-10 in the third quarter at the time of this posting. Update: The Bears won, 21-13, so both Chicago and Minnesota have 4-6 records. Roles reversed: Last year at this time, it was the Packers’ starting quarterback who had a broken collarbone and the Eagles came into Lambeau Field facing a backup QB. This year the roles are reversed, as Eagles starting QB Nick Foles broke his collarbone a couple of weeks ago and Mark Sanchez has stepped into his place. Hot at home: The Packers come into today’s game a perfect 4-0 at Lambeau Field thus far in 2014, and the streak is even hotter than that. Since falling behind the New York Jets 21-3 in the first half back in Week 2, the Packers have outscored their opponents at home 163-44 heading into today. Weather update: Temperatures are in the mid-20s with winds around 10 mph, putting the wind chill in the teens. There is no significant threat of precipitation during the game. X factor? : The Eagles acquired RB Darren Sproles from the Saints in the offseason for a fifth-round draft choice, and he visits Lambeau for the third time in the last four seasons.